In the heart of Sherwood Forest lies the picturesque, yet unassuming, village of King’s Clipstone. Between the twelfth and fifteenth centuries one of the very largest royal palaces ever to have graced the Mediaeval landscape stood there. The palace was visited by eight kings who held parliament, Christmas feasts and tournaments; were visited by the king of Scotland, a papal envoy and traitorous barons; built a fortification, great hall and a stable for two hundred horses; went hunting, drank wine and conceived a prince; listened to storytellers, poets and singers. This is the history of one of the great lost buildings of Britain and of the individuals that built, worked and lived there. Above all this is story of the people whose lives have been shaped for centuries by an extraordinary structure standing in a remarkable landscape. James Wright is a Senior Archaeologist at the Museum of London Archaeology. Formerly he has worked as a conservation stonemason. 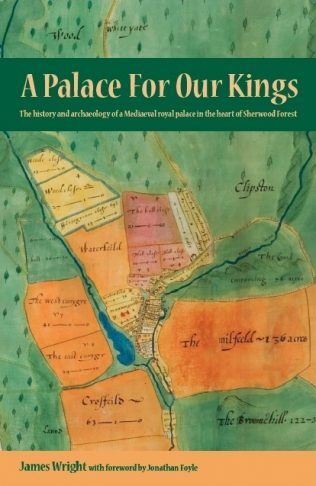 His previous publications include a book on the Castles of Nottinghamshire and several journal articles relating to castles and palaces. Alongside fieldwork at Mediaeval buildings such as the Tower of London, Knole, the Palace of Westminster and Southwark Cathedral he has researched the history and archaeology of Kings Clipstone for over twelve years.